This image taken with the NASA/ESA Hubble Space Telescope shows one of the galaxies in the survey to refine the measurement for how fast the Universe expands with time, called the Hubble constant. The galaxy, UGC 9391, contains two types of stars that astronomers use to calculate accurate distances to galaxies, a key measurement in determining the Hubble constant: Cepheid variables (marked with red circles) which pulsate at rates that correspond to their true brightness; and a Type Ia supernova (the blue cross indicates the position of the supernova 2003du). These supernovae are another commonly used cosmic yardstick. They flare with the same brightness and are brilliant enough to be seen from relatively longer distances. 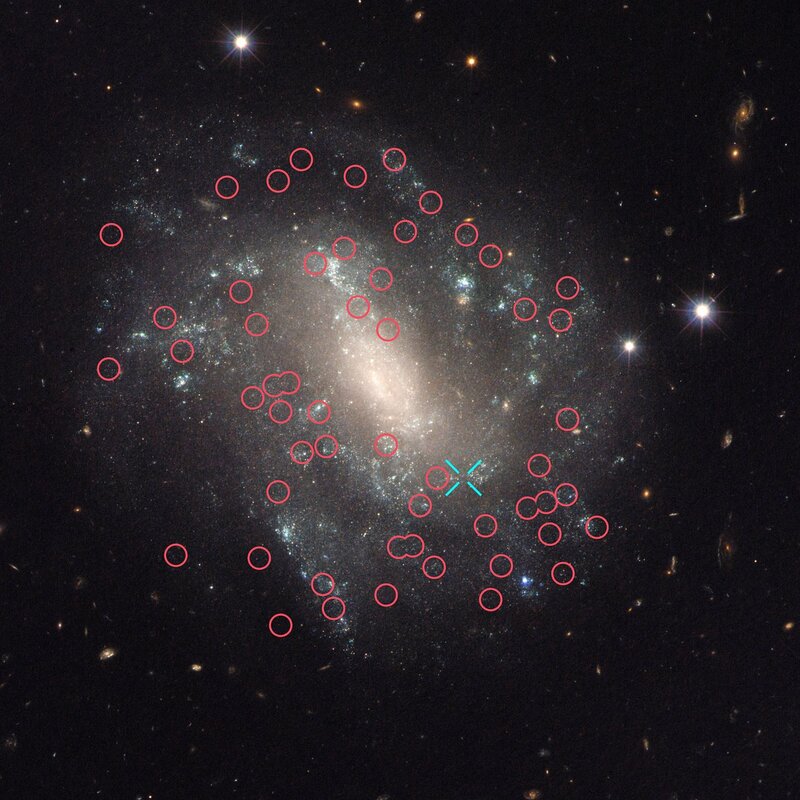 Astronomers calibrate the supernovae with the Cepheids in galaxies such as UGC 9391 so that they can accurately calculate the distances to faraway exploding stars. UGC 9391 itself resides about 130 million light-years from Earth.